Get your kids helping out in the kitchen with this Kitchen Chores Chart for Kids by Age! I think one of the greatest gifts we can give our children is enabling them to care for themselves. Teaching them the life skills they will carry with them after they leave our care will take them farther than just about anything else we can give them. If we do every single thing for our children, where does that leave them when they are on their own? They become adults who don’t know how to fold laundry, run a dishwasher, or clean a sink. These are basic tasks, but if you’ve never done it, you’re lost. Let’s be honest. 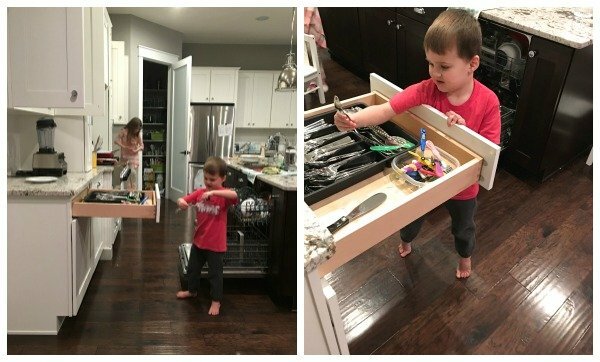 It’s not easy to consistently have our kids do tasks around the house. First of all, anything I ask them to do I know I can do it better and faster. I have to force myself to let. that. go. Really. Let it go, Elsa style. Then there’s the resistance. I remember when I first really started having Meghan do chores around the house. Oh, she was so excited! She looooved helping mommy. She was three. That novelty quickly fades and now that she’s seven, I get more groans than excited squeals when I remind her to do a task. But kids quickly adapt to consistency. When it becomes an expected part of their life, they may still groan, but they get it done. They know there isn’t an option. I’d love to share with you some of the tasks I ask my kids to do around the house. Let’s start in my favorite room: the kitchen! 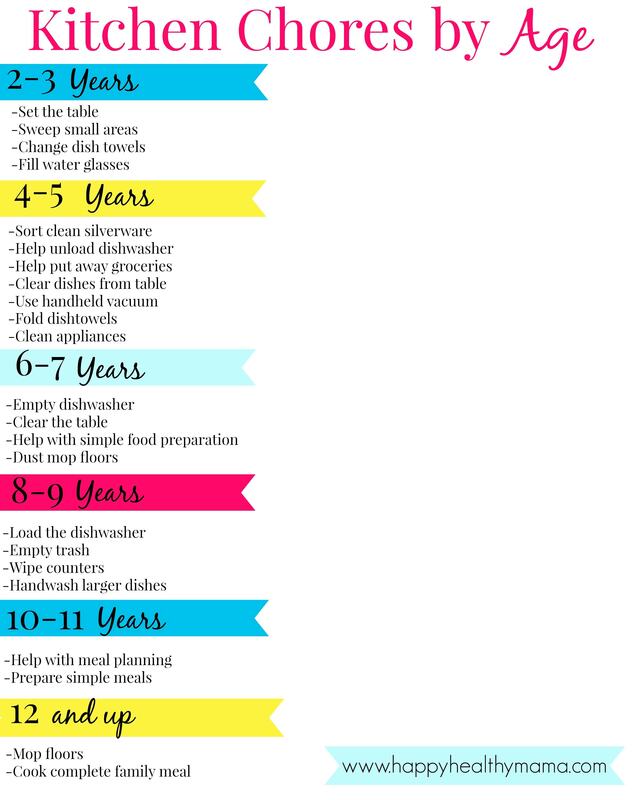 This Kitchen Chores Chart by age will guide you in figuring out what you can expect your kids to do at different ages. Remember, it’s just a guide and every child is different. Use your judgement. 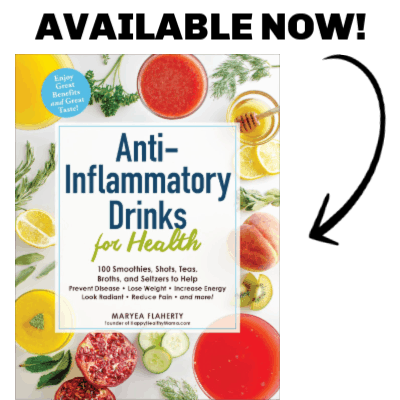 If you’re lucky enough to have kids who are still quite young, you can start this out and make it a habit before they are old enough to resist. If you have older kids and haven’t asked them to do much around the house, it may take longer to implement, but stick with it. Remember, they may not know it, but you are giving your children a gift! 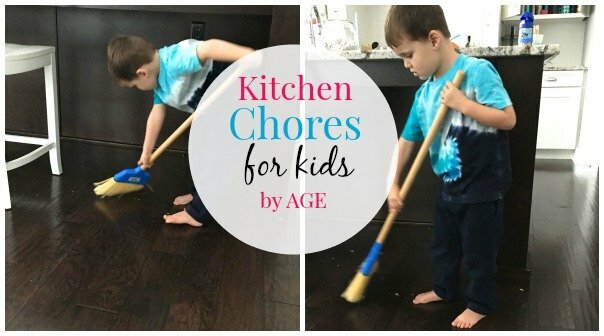 Do your kids do chores in the kitchen? Is there anything you think should be added to this Kitchen Chores Chart for Kids by Age? I had my kids clean the storm door windows, where their dirty little fingerprints often gathered. I can’t remember what age they were but they were more careful about where they put their hands when they knew that was on their list of to-do’s! My little guy is only 17 months old, but I noticed that he is starting to imitate. He actually loves “helping” unload the dishwasher – he picks out the spoons and forks individually and hands them to me. It’s really adorable and I’m looking forward to have him engage more in our daily to dos. Has he ever been asked to do those things? It certainly doesn’t mean he’s lazy. Kids raise to the expectations given to them. This is what I expect of my children and they do it because we are consistent with our expectations. Also starting at a young age helps a lot!